The operator of the store once appearing at this web address was found to be illegally selling replica Chanel products. To prevent this from happening again, a judge ordered the operator of the site to pay $570,000.00 in damages to Chanel and ordered the domain name transferred to Chanel. 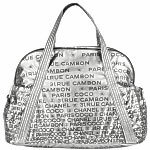 Among the offerings for sale on this website were a “Replica Chanel handbag 35899 patent purple” for $198.00, a “Replica Chanel Shopping Sac Bag Black 35914” for $175.00, a “Replica Chanel handbag 35943 black” for $198.00, a “Replica Chanel handbag 35948 black” for $207.00 and a “Replica Chanel handbag 35911 black” for $169.00 and a “Replica Chanel handbag Detachable Double Quilted Classic Handbag 35954 White” for $177.00. Each of the items was listed alongside a picture of what was purported to be the item offered. Additionally, some listings included information about the size of the item such as the listing for the “Replica Chanel handbag 35899 patent purple” which included the measurements 34×25.5×14cm / 13.3’’ x 10’’ x 5.5’’ or the listing for “Replica Chanel handbag 35948 black” which listed the measurements 46×29x16cm.